The number of Egyptian pilgrims killed in the hajj stampede in Saudi Arabia last September has risen to 190, the ministry of religious endowments said on Sunday. In an official statement, the ministry said that the number of Egyptian pilgrims unaccounted for has decreased to 45, according to the latest information provided to the ministry by the Egyptian consulate in Jeddah. The ministry added that the consulate in Jeddah will match DNA samples from the dead pilgrims provided by Saudi authorities with the DNA of the pilgrims’ relatives provided by the Egyptian health ministry in order to identify the corpses. The stampede occurred on 24 September, while pilgrims were converging on the site of Mena to throw pebbles at one of three walls representing Satan, the symbolic "stoning of the devil" marks the last day of the hajj event. 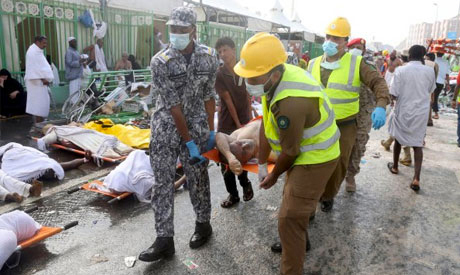 According to Saudi Arabia, 769 pilgrims were killed in the disaster. However, according to tallies provided by foreign officials, the death toll from last month's hajj stampede has topped 2,000, making it the deadliest disaster in the pilgrimage’s history by far.